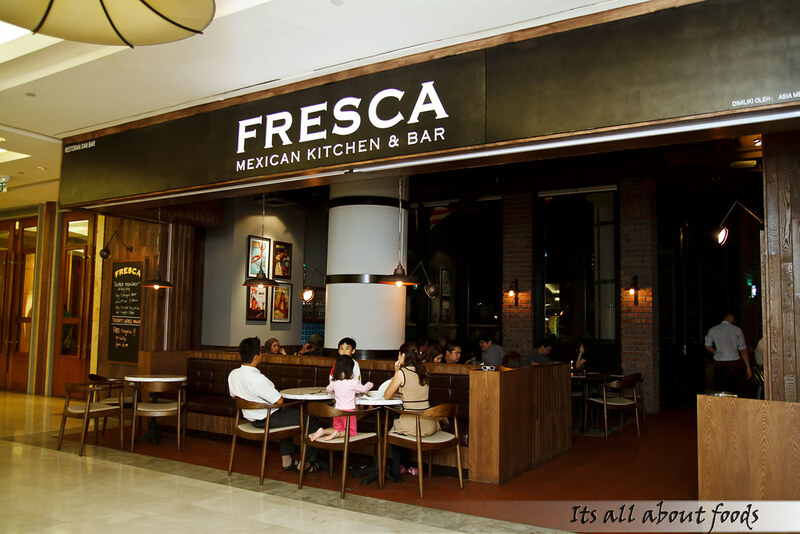 Tucked away in the quieter area of The Gardens Mall, Fresca Mexican Kitchen & Bar is a new born restaurant that serves quality and authentic Mexican food in an affordable price. Though the restaurant was quite hiddenly located with less foot traffic , it was doing a good business when we stepped inside one late evening. As we always say, a restaurant with good food will never short of customers. The restaurant features an array of vintage accents by having dark wooden dining tables and chairs, symmetrically shaped ceramic floor tiles, brick-stacked walls with huge mirrors to create an illusion of extended space and ‘secret passages’, Mexican paintings, and comfortable hue yellow lights. There is also a solid wooden bar counter with marble-clads surface, big, long and eye catchy with many alcohols bottles behind the counter. 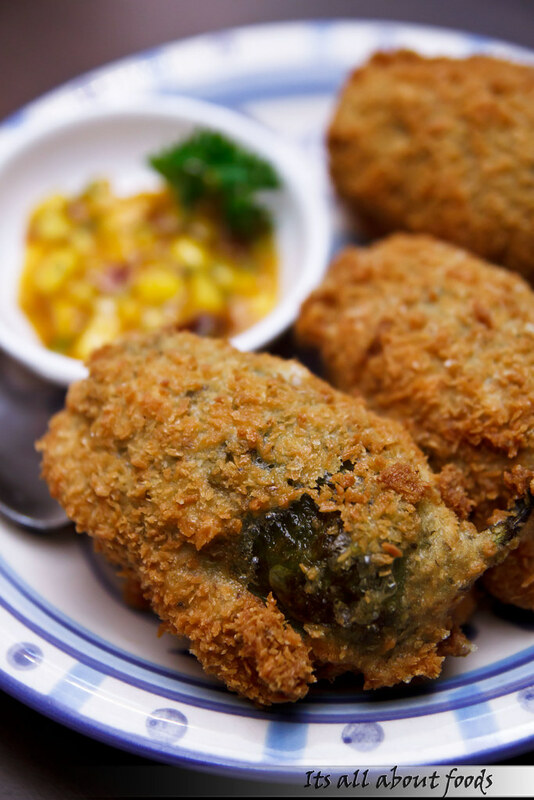 The meal starts off with Jalapeno Poppers, where Jalapeno peppers are stuffed with Monterey Jack Cheese and minced beef, coated with bread crumb and deep fried into golden brown. 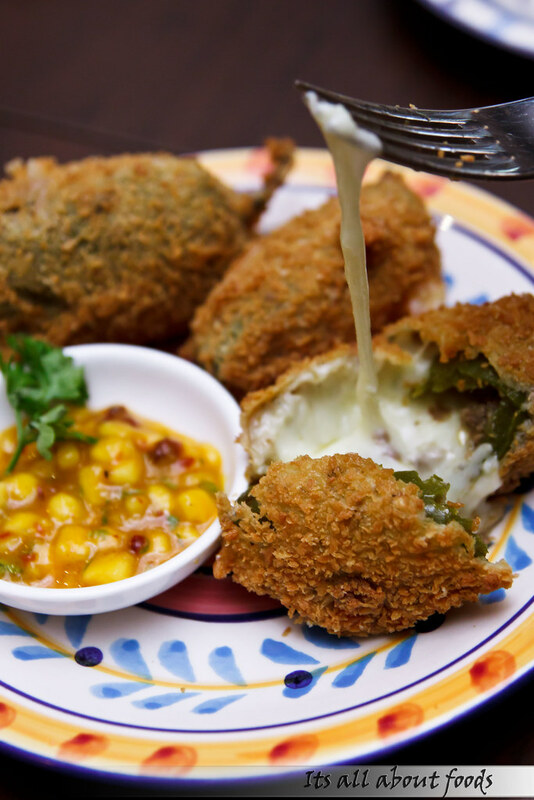 Fork up one and dipped with the mango salsa sauce then pop into mouth while it is still hot, we experience a crispy, cheesy, spicy, and zingy flavour that we immediately fall in love with. 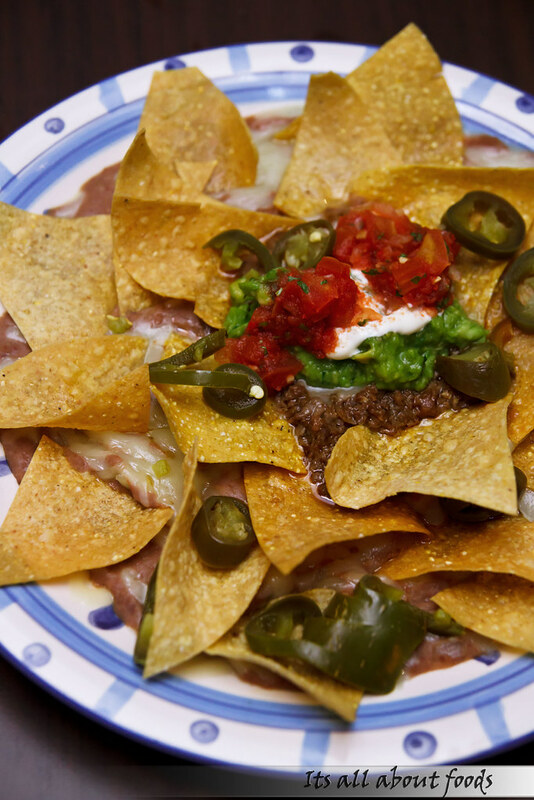 Continue on is the the Nachos Grande, consists of tortilla chips layering with refried beans, Monterey Jack Cheese, Ground Beef, Jalapeno Chillies, Guacamole and Sour Cream. A combination of crispiness and creaminess that make us can’t stop munching on. A recommended starter in hearty servings to keep you go with your beer, so remember to grab a serving of Nachos Grande should you want to have a long chit chatting with friends at Fresca . Camarone al Ajillo, meaning shrimp in garlic sauce. 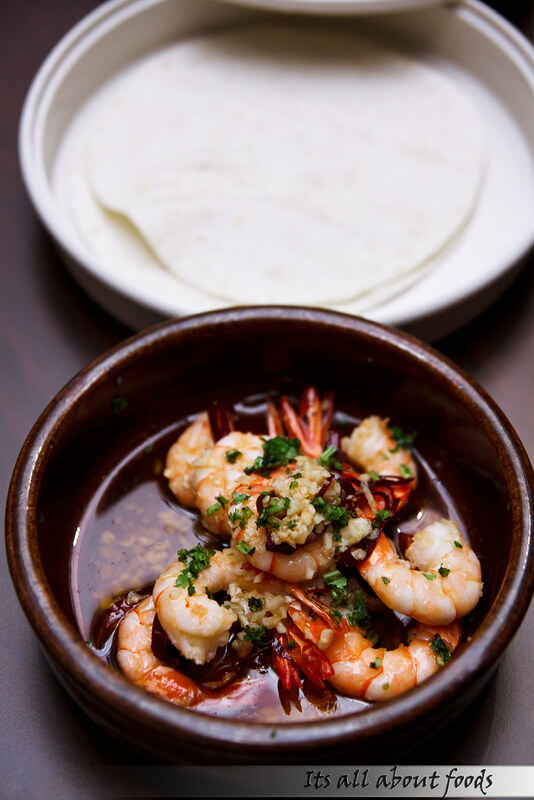 It is basically a shrimp dish saute with Guajillo Chiles and garlice, serve alongside with flour tortilla. Enjoy the succulent Tiger Prawns by arranging them in the tortilla and roll it up. Satisfaction follows when the aromatic spiciness of the garlic and freshness of the ‘Ajillo’ complement the fluffy tortilla heavenly in the mouth. 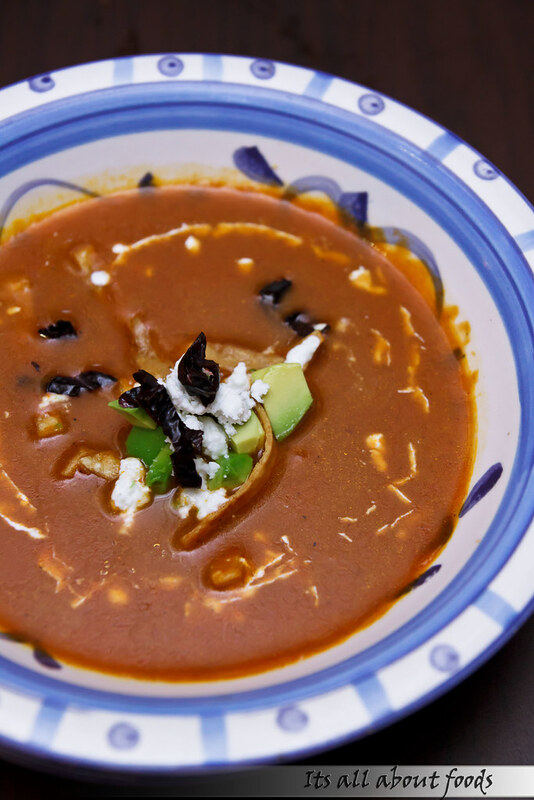 A classic Mexican soup where a rich broth is cooked with Guajullo Chile, added with fresh avocado, Ancho Chile, crumbly feta and deep fried tortilla strips. Simple, comfort and nutritious. Looks pale and lackluster? No, not at all. 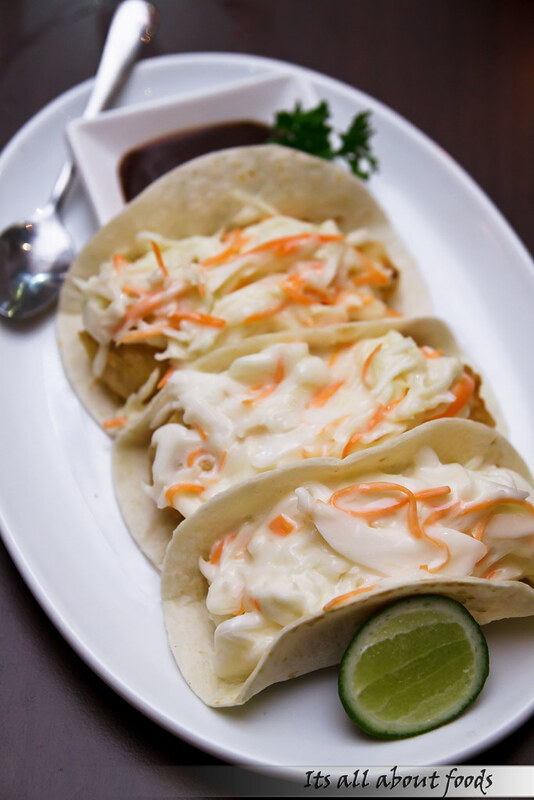 This Tacos Ensenda has lightly beer-battered fish and homemade coleslaw nestled on fresh, warm tortilla, bringing an authentic Mexico flavour that tastes wholesome and delightful. The coleslaw is creamy, lending extra moisture flavour to the tacos. The girl likes tortilla in any kind. So getting another serving of Quesadilla makes her smile. 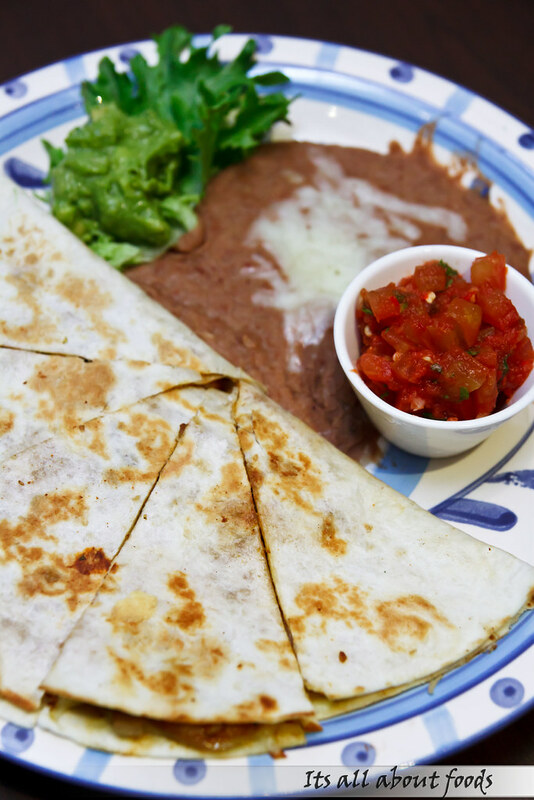 The Quesadilla resembles a thin pizza with savoury filling of your choice-seafood, chicken & onion or spinach mushroom & feta. All taste differently but equally delicious, suitable as snack for sharing or as staple food for those who prefer a light meal. Warm corn tortillas brimming with minced beef or chicken filling, topped with melted cheese and red chilli sauce, definitely a deep and rich flavours that will bring your tortilla to a new level. 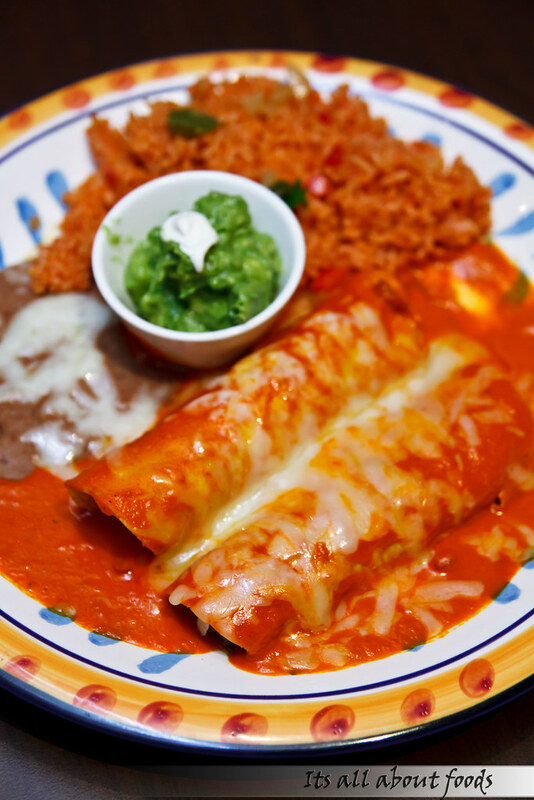 It is served with guacamole, refried beans and Mexican red rice for a more complete meal. 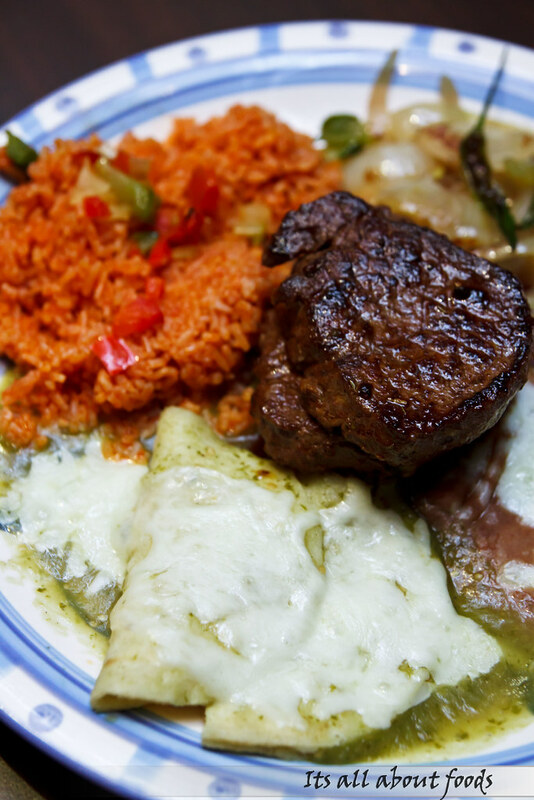 Grilled beef tenderloin with onions, Mexican red rice, enchiladas verdes and refried beans. Unique in taste, but acceptable. Big in serving and suitable for those who wants to have a filling meal. To ends the meal, we tried on two types of classic Mexican desserts. 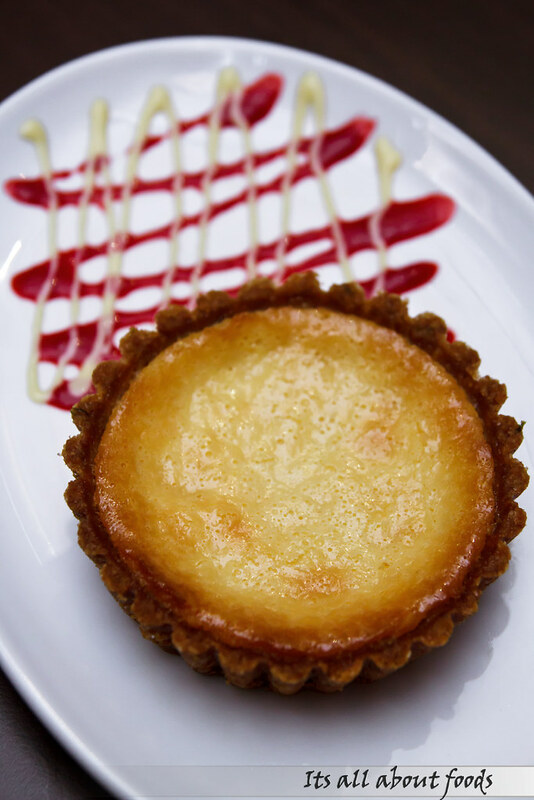 One of it is the Tequi-lime Pie, a pastry tart with thick and creamy cheese filling, infused with a hint of citrusy lime juice and tequila to give a vibrant taste. We prefer a flaky and puffy pastry crust, but we do like the delicate filling. 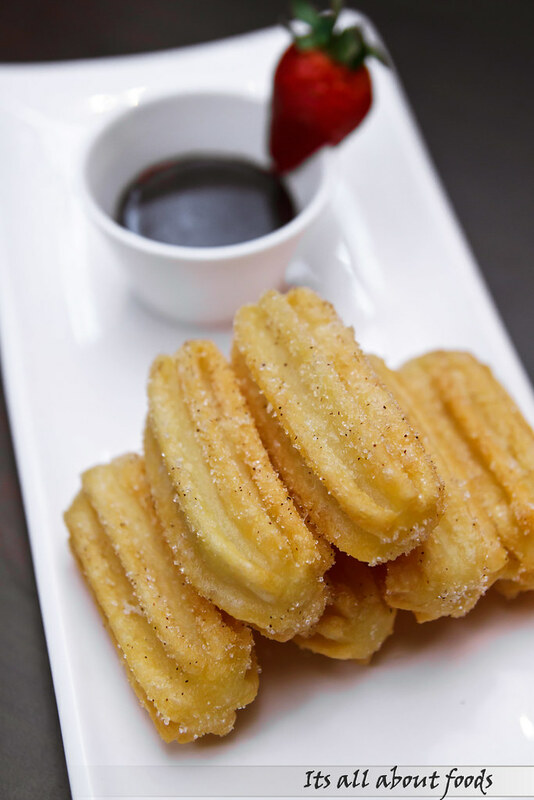 The second one will be the Mini Churros, which is Mexican donuts rolled in cinammon and sugar, best eaten with chocolate sauce. A combination of sweet plus sweet but still making us crave for more. In short, our journey to Fresca Mexican is a pleasant one, and we especially like their starters and tacos. The great ambience speaks for herself, and it is definitely another new good place in town to hang out with buddies, even just for a drink at the bar counter. Mid Valley City, Kuala Lumpur.